Issue #51 is now available to download. 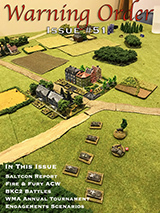 This issue features a report on SaltCON, where our group did a Phantoms game, two BKC2 battles, and three Hail Caesar slugfests! There's also the usual game reviews, fetaures, scenarios, and several battle reports. WFHGS is a wargaming group in Northern Utah that primarily focuses on miniatures gaming in a wide variety of periods and scales. The group consists of a half dozen members who have been together for well over 15 years and together we have accumulated thousands of figures for our wargaming projects. The club meets every other Friday night and we are currently involved in more than twenty different gaming eras as well as board wargames. WFHGS is also the home of Warning Order, a free, full color wargames journal that is available to download from this site. 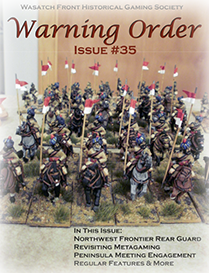 Each issue of Warning Order features battle reports from our Friday night games, reviews of board games, figures, and gaming products, gaming analysis, and several regular features plus an editorial. Click on the image to the right or the Warning Order tab in the menu to see all of the available issues. 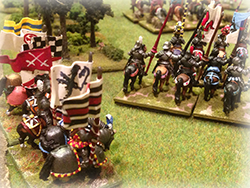 Every game from our Friday night sessions is chronicled in the Friday Night Update which shows the rules and figures we used, a short battle report, and images of the game. This is probably the most popular section of the site as many gamers just want to know what we're up to out here! Most of these will find their way into Warning Order issues as battle reports with images that didn't get into the update, maps, and orders of battle. 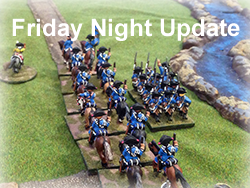 To see the latest update, click on the image to the right or choose Friday Night Update under the Club Info tab on the main menu. 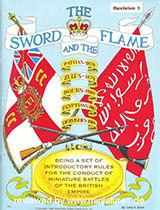 The WFHGS site is also home to several sets of rules and campaigns for miniatures gamers. 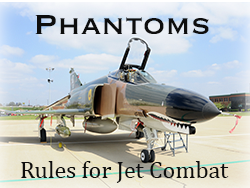 Besides the Phantoms and Intruders rules for modern jet combat, there are campaigns such as Valley of Fire for the Northwest Frontier and The Return of the False Prophet of the San Juans, which is a campaign for the Sudan era. The campaigns include rules, maps, and counters that are free to download. To view all of the rules and campaigns that are available to download click on the image to the right.